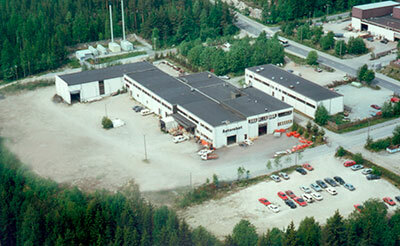 Autorobot Finland Oy, manufacturer of EasyBoatRoller shore dock, is a long-standing family business with experience from the metal industry already since 1977. The father of the EasyBoatRoller idea, Olavi Venäläinen, initially founded the company as an auto body repair shop in 1969. He has been responsible for many inventions during his career and received numerous patents both in the auto body repair field and for boat dock and dock inventions. The Autorobot straightening devices for crashed cars, manufactured by the company, have been exported to more than 70 countries. The idea for developing a new kind of dock was created from the need to launch the boat into the water more easily and pull it up on dry land. Olavi’s own boat was heavy, and putting it into winter storage at the cottage shore was challenging. One autumn, the boat almost got iced in because of the surprising arrival of freezing temperatures. At the same time, the daughter’s family had acquired a new aluminium boat, which could not be pulled up on dry land in the same way as the previous row boat. The continuous variation in water level had made launching the boat into the water difficult already with a smaller boat. These problems gave rise to the idea that other boaters could also encounter similar difficulties, so Olavi began to design a new kind of boat dock. Initially, we tested a few models, in which the boat was pulled onto rollers or wheels. They were, however, cumbersome to use, and there was too much strain caused to the bottom of the boat. For that reason, we wanted to develop a product that is light to use and safe for the bottom of the boat. The first proto model for the current dock was finished in autumn 2010, and we noticed right away that the product was operational and that others could certainly benefit from it as well. EasyBoatRoller was brought onto the market in 2013 as a result of intense development and testing work. Olavi’s son-in-law Simo Korhonen has also actively participated in the development work. He works in EasyBoatRoller sales in Finland together with his spouse Mervi Korhonen. Mervi Korhonen handles the international sales of EasyBoatRoller. The company’s production uses modern production automation, so the products are dimensionally accurate, of high-quality and durable. The company is located in the Neulamäki Industrial Area, close to, for example, the necessary hot-dip galvanising services.